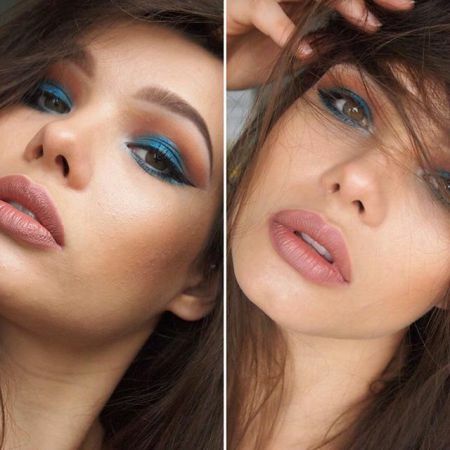 When speaking of makeup in blue tones, we specifically mean eye makeup. And in this case, the color of the iris should be a decisive criterion for selection. Despite the fact that blue eye shadows are considered to be widely popular, they are in fact very insidious. Unfortunately, there is a color taboo regarding blue in cosmetology, and first of all, it concerns women with green eyes. Of course, some flamboyant women are ready for such experiments, but this is a different game set to different rules. However, there is a great deal of shades of green eyes. For example, if a green iris has a significant number of specks of blue, it can be worn to a very beautiful and elegant effect with the help of blue eye shadows. Carefully selected jewelry will complete this image. Women with brown eyes and chestnut hair should use blue eye shadows very carefully. And as for brunettes and blondes, they can afford such makeup, but only if they have a perfect sense of style, because the line between vulgarity and luxurious is thin. If blue-eyed girls think they can boldly use blue eye shadow palettes, they are dangerously mistaken. Eye shadows to match blue eyes should be of a lighter or darker tone than the iris. Eye shadows of natural color identical with one’s eye color must be strictly avoided. Gray eyes in combination with blonde hair are considered ideal for blue makeup. Blue palettes are one of the most capricious. One shade of blue might look outrageously tasteless combined with another blue shade. If you plan to use two or more colors of eye shadows from this palette, you should consider this feature. Eye shadows of gray shades that perfectly smooth these adverse transitions may help you. To find a balance of colors is complicated for women with chameleon eyes, whose eyes change color depending on different factors—gray-green eyes often have this effect. In this case, you will have to mix blue and gray (blue and green) tones with a shift toward a darker palette. White and silver eye pencils or some eye shadows of these shades can sometimes save even the worst blue makeup. Just remember this and experiment. ★ A little purple eye shadow will perfectly shade the blue ones. ★ Blue eyeliner is suitable only for evening makeup. ★ It is possible to circle the eyes with eyeliner, but it requires a fine, clear line on the outer edge of the lash line. 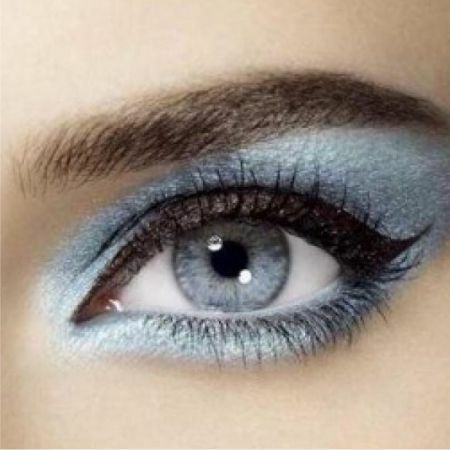 ★ Use light blue eye shadows, applying them in a thin line on the lower eyelids. ★ It is better to apply a bright blue line on the upper eyelid if you have dark eyes and bleached hair. ★ Blue makeup for slit eyes should complement silvery eye shadows or eye pencils. You can experiment with beige and green shades and the effect will be quite stunning. ★ Dark girls should use lilac and purple shades with a matte effect. ★ You can use black, blue, or gray mascara and eye pencils of the same colors; however, you should avoid the repetition of the natural color of the eyes and the lightest shade of eye shadows. ★ Lipstick and blush for blue makeup should be of soft pale shades and always in tune with each other. ★ Blush should be used only as a structuring, corrective makeup item. Excessive use of blush can give the effect of a "toy" face. ★ Do not use more than three shades of blue. ★ Blue makeup involves the creation of a cold image, and you need to follow it. Dress, shoes, and accessories are no exception. Watch out for the preservation of naturalness in your image. Remember that blue makeup does not forgive mistakes, and there is only one step from a luxurious image to vulgarity. Be successful and beautiful! Like the article «Blue Eye Makeup is Not for Everybody»? Share it with friends!